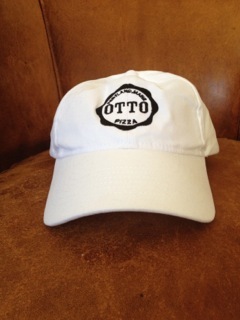 Win An OTTO Pizza Hat Just Like the Ones Worn by the Folks Behind the Counter! Here’s your chance to win an official OTTO Pizza hat, just like the ones worn by the folks who work there! If you’ve been to OTTO Pizza, or had OTTO Pizza delivered to you, you’ve probably seen them — those sylish, white hats that the kitchen and delivery staff wear. Here’s your chance to get one for yourself! To snag one, all you’ve got to do is visit our Facebook page, click on the “OTTO Hat Contest” link and fill out the form by 11:59 p.m., Sunday, July 1, 2012. We’ll select a winner at random from among the entries on Monday, July 2, and the lucky entrant should be sporting that new cap by the weekend! These are great hats, featuring the OTTO Pizza logo embroidered in black thread on the front of a 100-percent cotton, pure white cap, and until now the only way to get one has been to work at OTTO Pizza — which is a possibility. We’re always looking for good help. But if you’ve got a job, or are otherwise occupied in that respect, this is your best bet to get an OTTO Pizza hat. We’ve got no plans to offer them for sale. So get on over to our Facebook page and enter! You can’t win if ya don’t play. OTTO Pizza coach Brian Carleton serves up some pizza to the members of the Deering Little League OTTO Pizza Girls AA Softball Team as they celebrate the close of their successful season with some pizza at OTTO Pizza’s Munjoy Hill location last night. 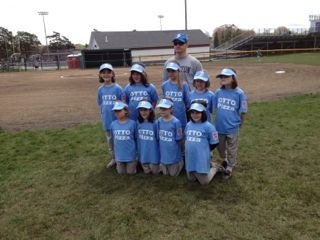 This year, OTTO Pizza sponsored a girls softball team in the AA Division of Portland’s Deering Little League. 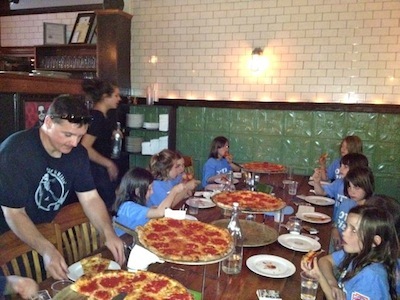 The girls, all seven and eight years old, wrapped up their season last night with a game at the Hall School field, whereupon the entire team adjourned to OTTO Pizza’s East End location on Munjoy Hill for a celebratory pizza party. In addition to the pizzas, the girls enjoyed a special cake commemorating their season and tore into two packs of Topps 2012 baseball cards, supplied by Assistant Coach Danny Terroni. It was a great year, and the best part of it was watching all of the girls improve as players as the season progressed. It was a real treat to watch them learn how to play the game and then put those skills to use on the diamond in the games each week. The members of OTTO Pizza’s Deering Little League AA Girls Softball team gather for a team photo at the beginning of the season. Coach Brian Carleton did a great job teaching the girls how to hit, how to field and how to make accurate throws, and every game was well-attended by the players’ parents, friends and family. We’re proud of the girls, not just those who played on the OTTO Pizza team, but of all of ’em who played in the league this year. It was an honor to be able to be a part of it all and we’re looking forward to being involved again next year. 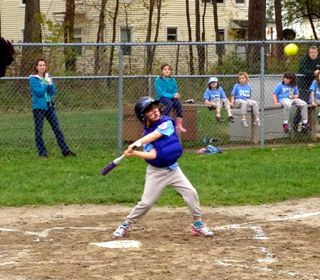 A member of the OTTO Pizza AA Girls Softball Team in Portland’s Deering Little League drives a solid hit up the middle as her teammates look on.